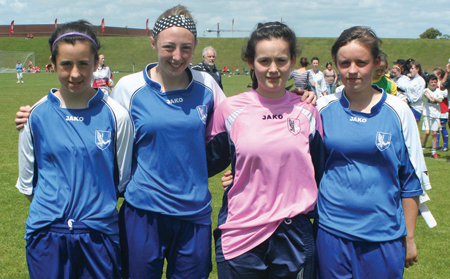 Alana Moran, Lisa Casserly, Saoirse Burke and Maria O’Dowd of Colga FC and Connacht u-16s. Connacht ladies have been crowned the u-18 Gaynor Cup 2011 champions. Played on a league basis, Connacht, along with Dublin, suffered just one loss, but it was the ladies from the west who claimed the title on points difference after a 7-0 victory over Ulster. Connacht started the competition with a 2-0 win over North Munster before continuing their winning ways with a similar victory over South Munster. South Leinster proved trickier, but Connacht still prevailed by 2-1. Connacht went into the next match requiring only a draw to claim the crown, but Dublin came out on top by 2 - 1, thus ensuring the title would come down to points difference. However the local team came up trumps as they rose to the occasion and crowned a successful tournament with a big win over Ulster, while Dublin could only muster a 1 - 0 win. Galway was represented by Colga’s Leah Philips and Jenny Linnane and Salthill’s Laura Carroll and Shaunagh Jackson. The u-16s were drawn in group two of a two group league, with the top team in each group playing for the cup. Connacht were unlucky in their first game when, having enjoyed control for much of the match, they were defeated by the Midlands 1 - 0. However they made amends against North Leinster with a 3 - 0 victory, and went up against eventual winners South Munster looking for another big win. Although they controlled the game, they could not convert their chances and it finished 1 - 1. They then drew 1-1 with Ulster for the fourth/fifth place play-off and could have lost it in the last minute, but for a brilliant save from Saoirse Burke from a penalty kick. However in the end they lost on penalties. Galway was represented by Salthill’s Shauna Fox, top goal scorer for Connacht Cadhla Gillian and Ciara Lynagh. There were four representatives from Colga, goalkeeper Saoirse Burke, Maria O’Dowd, Lisa Casserly and Alana Moran. Under-16 results: Ulster 1 - 2 Dublin; South Leinster 3 - 0 North Munster; South Munster 5 - 0 North Leinster; Connacht 0 - 1 Midlands; North Munster 0 - 1 Ulster; Dublin 0 - 2 South Leinster; Midlands 0 - 1 South Munster; North Leinster 0 - 3 Connacht; Ulster 2 - 3 South Leinster; North Munster 0 - 5 Dublin; South Munster 1 - 1 Connacht; Midlands 2 - 0 North Leinster. Final: Leinster South 0 - 3 South Munster. Under-18 results: Dublin 0 - 1 Ulster; South Munster 1 - 1 South Leinster; Connacht 2 - 0 North Munster; South Leinster 0 - 2 Dublin; Ulster 1 - 0 North Munster; South Munster 0 - 2 Connacht; Dublin 5 - 0 North Munster; South Leinster 1 - 2 Connacht; Ulster 2 - 3 South Munster; Connacht 1 - 2 Dublin; North Munster 0 - 2 South Munster; South Leinster 2 - 0 Ulster; Dublin 1 - 0 South Munster; Connacht 7 - 0 Ulster; North Munster 0 - 4 South Leinster.